Yamanaka and Moreno go again, but who will come out on top? ​Last September we saw a huge, and highly controversial, Bantamweight fight in Japan as Shinsuke Yamanaka (25-0-2, 17) retained his WBC title with a split decision win over Panama's Anselmo Moreno (36-4-1, 12). The bout, a mandatory defence for Yamanaka, saw many suggest Yamanaka had gotten a gift and soon lead to Moreno getting a world title eliminator for a rematch. The Panamanian won the eliminator, defeating Suriyan Sor Rungvisai, and put us where we are today. In their first bout Yamanaka really struggled to land clean on Moreno. His much vaunted power was neutralised and he was made to look slow and old, like a man struggling to give 100% of himself at the weight. Since then he has fought once, over-coming Liborio Solis in a a bout that saw both men being dropped, twice. For Moreno he's also fought just once since the first bout, scoring the aforementioned win over Suriyan. At his best Yamanaka was a destructive fighter with a vicious left hand, under-rated skills, and a good boxing mind. He wasn't the quickest or the most defensively sound but he was a big puncher who could take a shot and set them up. As he's gotten older however he's fallen in love with the power, and has become predictable with everyone knowing he's always looking to land the dynamite left hand. At his best Yamanaka was a real sensation and his resume is incredibly impressive with wins against the likes of Vic Darchinyan, Tomas Rojas, Malcolm Tunacao, Suriyan Sor Rungvisai, Moreno and Solis. The last 3 of those wins however have made Yamanaka look more and more human and not like the force he once was. At the age of 33 Yamanaka is old for a Bantamweight and he has been making the weight since 2006. It's fair to say the the weight is becoming harder and harder for him to make and at 5'7” he is a big Bantamweight. The age and struggles with weight have likely been plaguing Yamanaka in recent bouts, but he has continued to fight at the weight, a choice that has perhaps cost him in terms of performance. Whilst Yamanaka is a true puncher the way we'd describe Moreno is as a pure boxer. He's tricky, he's smart and he's technically excellent with a lovely array of punches, intelligent movement, excellent defense and an amazing ability to read distance. In many ways he's an old school fighter with old school skills, and uses those skills, and his freakishly long arms, to neutralise opponents and get his own shots off. Aged 30 Moreno is still in his prime and his resume is exceptional, with victories over the likes of Tomas Rojas, Volodymyr Sydorenko, Rolly Lunas, Mahyar Monshipour, Nehomar Cermeno, Lorenzo Parra, Vic Darchinyan and Suriyan. It may be noted that he has lost his last two bouts but both were in questionable circumstances and there is little doubting his claim to be one of the truly elite Bantamweights. With 4 losses to his record the ignorant fan may well see him as a poor fighters but one of those losses was early in his career, one was to Abner Mares at a weight that Moreno looked poor at, and the other two were the questionable defeats, to Yamanaka and Juan Carlos Payano. He's far from a fighter coming to the end of his career and although he hasn't always looked fantastic he usually raises the bar when he's fighting a top opponent, like Yamanaka. Whilst Yamanaka will be a confident fighter coming in to this fight. It is worth noting however that Panamanian fighters appears to have the number of Japanese fighters this year and we've already seen Jezreel Corrales stop Takashi Uchiyama and Luis Concepcion over-come Kohei Kono in Japan. A win for Moreno would complete a remarkable year for Panamanian fighters in Japan and would continue a great rivalry between the two countries, who have had a rivalry dating back decades. We suspect that Moreno will come out on top here, with Yamanaka's poor recent performances coming to haunt him against a very skilled fighter. Yamanaka has a chance, a puncher always does, but we suspect he'll struggle again to land on the brilliant visitor, losing a clear cut decision. The Bantamweight division promised a lot for Japan last year but delivered little more than disappointment with a number of losses for fighters who were favoured, including Ryo Akaho, against Pungluang Sor Singyu in a WBO title fight, Tomoki Kameda, twice against Jamie McDonnell, and Shohei Omori, who came up short against Marlon Tapales in a world title eliminator. Even when Japanese fighters won they were disappointing with the all conquering Shinsuke Yamanaka (24-0-2, 17) also failing to shine, defending his title twice. The first of those defenses was an expected and simple win over the horribly over-matched Diego Ricardo Santillan whilst the second of those defenses saw the Japanese puncher come up very fortunate against Anselmo Moreno. On March 4th Yamanaka returns to the ring and hopes to return to his dominating best as he hunts a 10th defense of the WBC Bantamweight title, and faces off against Venezuelan warrior Liborio Solis (23-3-1, 10), a man who is well known to Japanese fans. For Solis the bout will see him attempt to become a 2-weight world champion and look to record his third win in Japan, where he actually holds a 100% record with both previous wins being big ones. Not only is the challenger trying to keep his perfect Japanese record but also extend a 14 fight winning run. The champion is widely regarded as the top Bantamweight and his reign as the WBC champion has been impressive, though relatively over-looked. He has yet to fight outside of Japan but has scored notable wins over the likes of Vic Darchinyan, Tomas Rojas, Malcolm Tunacao, Suriyan Sor Rungvisai and Anselmo Moreno. Although some of those bouts were close he did the important thing of pulling out the victory and has got himself a solid looking resume. Not only has he scored some solid wins but he has done so whilst becoming a star in Japan and being able to draw a sizeable TV audience. In the ring Yamanaka is well schooled, but not an elite level boxer. He has a very good variety of punches in his arsenal but often neglects many of his punches whilst looking to land his thunderbolt left hand. That left hand has got fight ending power, but recent he has looked overly predictable as he attempts to land it. That predictability has made life easier for recent opponents and whilst he has scored 14 stoppages in his last 17 he has gone the distance in 2 of his last 3. Whilst the champion is regarded as a genuinely elite world level fighter the challenger is much more over-looked, despite having been a former WBA Super Flyweight champion and holding a number of notable wins on record. Those wins include a decision in Panama over Rafael Concepcion, who famously gave Nonito Donaire fits and a decision in Mexico against Jose Salgado, as well as a huge win in Japan over current world champion Kohei Kono and a controversial victory over Daiki Kameda. To many fight fans in the East it was Solis's win over Kono that really solidified Solis as a world class talent, and it was a hell of a fight with both men being dropped and both going to war with Solis taking a majority decision over the popular Watanabe gym fighter. Whilst that win really made Solis, in many ways his win over Kameda was the beginning of the end for the Kameda clan and saw Solis missing weight for a Super Flyweight unification bout. Since then he has fought as high as Featherweight and last time out scored a win over Jonathan Baat. In the ring the 33 year old Venezuelan Solis is a tough, busy action fighter. Technically he's not the biggest or most technically capable but he comes to fight and will continually bring pressure with a high work rate and look to turn everything in to a war. It's a style similar in some ways to Suriyan, who gave Yamanaka hell in 2014. Given the styles of the two men we're expecting something really exciting here with Solis bringing the pressure and Yamanaka boxing on the backfoot, lining up the left hands in an attempt to take Solis out. The fight should be a high paced and all action affair with Solis bringing the fight but it's hard to see him having the power to hurt Yamanaka. The bout, we suspect, will look similar to Yamanaka's bout with Suriyan with Yamanaka doing enough to claim the win, but certainly not looking at his best. The Bantamweight division is one of the hottest in Japan right now. The country boasts two of the truly elite divisional fighters in the form of WBC kingpin Shinsuke Yamanaka and WBO champion Tomoki Kameda. It also boasts a brilliant set of contender level fighters, such as Shohei Omori and Kentaro Masuda, who may well have fought by the time you're probably reading this, Ryosuke Iwasa, who is set to get an IBF title shot later in the year, and WBO #1 ranked contender Ryo Akaho. It's fair to say that the coming year will be a major one, especially given the news about Iwasa's bout with Lee Haskins and the up coming contest between Tomoki Kameda and WBA "regular" champion Jamie McDonnell. Iwasa and Kameda however are trailing well behind Yamanaka in terms of resume so far and before either of them get the chance to change that we will see Yamanaka return to action and distance himself yet further from his compatriots. That comes about on April 16th when the unbeaten Yamanaka (22-0-2, 16) takes to the ring in the search of his 8th world title defence and a victory over unbeaten Argentinian Diego Ricardo Santillan (23-0, 15). This will be Yamanaka's first bout against an unbeaten opponent since his 2011 war with Iwasa, though few are giving Santillan any type of chance in a bout widely considered a mismatch, despite the fact neither man has tasted defeat so far. The reasons Yamanaka is so heavily favoured are numerous though they tend to come down to the fact he's more proven, has the more impressive wins and the more complete skill set. In fact in terms of his resume there is no active Bantamweight who can compare with Yamanaka, who already has wins over the likes of Iwasa, Christian Esquivel, Vic Darchinyan, Tomas Rojas, Malcolm Tunacao and Suriyan Sor Rungvisai. The Japanese puncher is dubbed the "God Left" due to his rocket like left hand which has destroyed numerous opponents in his 24 fight career. In terms of over-all boxing he's not the most impressive, in fact in many ways he's a one-trick pony but his one trick is an excellent one. He looks for an opportunity to land his home run punch and often connects. Aside from the left hand he does have a solid, though massively under-utilised, jab and a spiteful array of other shots that continue go under-used. Aged 32 Yamanaka is seemingly still in his prime. He has been involved in one or two wars, with the Iwasa bout standing out, but over-all he's not taken too much damage courtesy of his left hand and his intelligent footwork, which is used to set up his straight. From his 24 career bouts he has only amassed 157 professional rounds, around 6.5 rounds a bout, and has stopped 14 of his last 16 opponents. Although there are flaws with Yamanaka, notably his refusal to use his jab to set up his left hand, he's a really hard fighter to beat. Firstly a fighter needs to be built of really tough stuff, and then they need to either out box him or work him. To date no fighter has been capable of that, though Suriyan did show the blueprint in to how to beat Yamanaka, though was dropped several times for his effort and relied on his super human toughness to just see out the 12 rounds. Going through the record of the 27 year old Santillan yields little to really tell us how good he is. On paper his best win came almost 5 years ago when he stopped compatriot Guillermo Osvaldo Soloppi, then 13-0, in 5 rounds for the for Argentinian Bantamweight title. Since then however Soloppi has gone 5-5 with only a single win against a fighter with a winning record and doesn't look like a genuinely good win. Similarly a win over the then 11-0 Oreste Bernabe Nieva looks less impressive now than it looked at the time. Most worryingly for Santillan, at least in regards to his record, was his struggle past the limited Lucas Rafael Baez in a very competitive bout that saw Santillan getting the "home nudge" to retain his perfect record. From the footage that we've managed to see of Santillan he appears to be slow footed, offensively reckless and defensively open. In terms of his power it's not impressive enough to worry a fighter like Yamanaka and he's not aggressive enough to put Yamanaka under the pressure that Suriyan did last time out. Whilst it's fair to say that Suriyan did give Yamanaka a very tough time last time out it's hard to see Santillan doing the same. The Argentinian does look tough but he's never been hit by anything like a Yamanaka straight left hand. We suspect that when he is tagged by Yamanaka's power he will feel it, and he'll feel it hard. We suspect that that power will finish off Santillan within 8 rounds with Santillan becoming another of Yamanaka's victims. Whilst this bout is, likely, to be one sided we expect that the division will go through a lot of changes in the next few months. We already know that Kameda Vs McDonnell is set, we know talks are on-going for Iwasa Vs Haskins and we'll also see Japanese and OPBF title fights in the division take place this month. It's hard to know exactly where the division is heading but it's certainly going to be an interesting year for fans of the Bantamweight division. 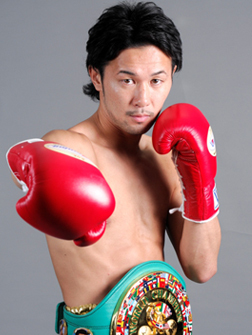 Yamanaka battles Suriyan in WBC title defense! For several years the Bantamweight division has had two rulers. One was Panamanian slickster Anselmo Moreno, a tricky pure boxer. The other Japanese destructive and unbeaten Shinsuke Yamanaka (21-0-2, 16). The two two couldn't be much more different with Moreno using movement, sharp jabs and rapier straights as well as tricky and jerky movements whilst Yamanaka often neglects the jab to set up rocket launcher left hands that have earned him the nickname "God of Left". At the end of September one of those men was dethroned as Moreno lost a controversial, and very difficult to watch, technical decision to Juan Carlos Payano, an unbeaten fighter from the Dominican Republic. That bout may have seen Payano win the title but at the end of the day it's actual affect was leaving us with just 1 proven and dominant champion, WBC holder Yamanaka. Had Payano iced Moreno in a 1-sided show case on Fox Sports 1, as the bout was intended to be shown on, then we'd be talking about Payano as a potential threat but that bout being unaired in the US, or online, has left more mystery and intrigue than anything else. In middle of October we will see Yamanaka back in action as he looks for the 7th defense of his belt in a little under 3 years and attempts to over-come mandatory challenger Suriyan Sor Rungvisai (37-5-1, 16), a former WBC Super Flyweight champion who is known for both his reign at 115lbs and his close bout with Pongsaklek Wonjongkam way back in 2010, a bout that saw many fans of the lower weights first take note of the Thai. For Yamanaka this is his most interesting fight since his hard fought contest with Malcolm Tunacao back in April 2013. It's the first time since that bout that the champion is facing a former world title holder and a man with proven world class ability and toughness as well as a proven history of given world class southpaws, such as Wonjongkam, a tough time. Despite those facts it does need saying that Yamanaka is a freak of nature. His movement is criminally under-rated, his timing is sensational and his counters, especially the left straight, is deadly. Watching Yamanaka can, at times, be frustrating with the Japanese fighter often looking like a purely 1-handed fighter. His jab is massively under-used, his inside work is good but again under-used and if you can neutralise that thunder-bolt right you can sometimes take him out of his gameplan. Despite looking like a 1-handed fighter however we've seen Yamanaka fight enough to know he has all the tools in his locker and his work on the inside can be just as devastating as his shots at range. It's just a shame he doesn't use them all unless truly needed, as was the case against Ryosuke Iwasa in a very memorable Japanese title fight back in 2011. As for Suriyan the Thai is a very tough guy who has shown an ability to go in hard with fighters like Nobuo Nashiro, who he defended his title against, and Wongjongkam. Saying that however he was, surprisingly, dropped twice by Yota Sato, indicating that whilst Suriyan is tough there may be questions as to how tough and how well he would handle a clear shot from a fully fledged Bantamweight. Saying that however the Sato fight was Suriyan's final bout at Super Flyweight and it is possible that he was suffering with issues from making the weight limit. Whilst the challenger is just 25 years old he is also an experienced competitor. He has a number of notable wins including decisions over Tepparith Kokietgym, Takashi Kunishige, Tomas Rojas and Nashiro. He also has experience of fighting on the road though like many Thai's his record outside of Thailand isn't great, in fact he is 0-3-1 outside of his home including an early career loss in South Korea to Jin-Man Jeon. It also need noting that he lacks a real standout win as a Bantamweight with his best Bantamweight win being a stoppage over the previously unbeaten Filipino Daryl Basadre in 2013. As well as a lack of notable Bantamweight wins he has also shown a relative lack of power, despite scoring 9 stoppages in the last 2 years or so. Those stoppages have come at such a low level that they have made Suriyan look like a bigger puncher than he is and in reality even those 9 stoppages have taken 17 bouts to accumulate. Although Suriyan is a talented boxer with a tight defense and good over-all skills it's hard to see what he really brings to threaten Yamanaka with. He doesn't have the power to make Yamanaka think twice about taking a risk and he also lacks the size to get inside and make the Japanese fighter really work for his win. The tight defense will force Yamanaka to do something to create an opening though we suspect that Japanese fight could box off the back foot very comfortably to take a wide decision if he can be bothered to get his jab into action. If Yamanaka does let his jab go then this could easily be a white wash with out the champion really breaking sweat. Whilst the champion could take an easy decision we actually suspect is that Yamanaka will hunt a stoppage, it's in his mentality and he appears to want to break Yoko Gushiken's 7 fight national record for most successive title defense by stoppage. If this is what Yamanaka goes for we suspect to see him soften up the challenger in the early and middle rounds before going for the kill in the latter half of the fight, it's there that we will find out how tough Suriyan really is. On paper we like this bout, in reality however Yamanaka is just too far too good for almost everyone else in the division. Suriyan would give almost everyone in the division a tough bout but not the "God of Left". Yamanaka looks for 5th straight KO and 6th world title defence against exciting Jamoye! When we talk about fighters we love to watch we tend to talk about fighters who have insane power and that ability to score an instant KO if, or rather when, they catch an opponent with a clean, full blooded power shot. This is one of the reasons that we love Gennady Golovkin, Sergey Kovalev and Takashi Uchiyama. Another man who can render opponents unconscious on a whim is Japanese southpaw Shinsuke Yamanaka (20-0-2, 15). The reigning WBC Bantamweight champion might "only" have a 68% KO record but he is a fearsome puncher and he knows it. The stats, suggesting he stops less than 7 in every 10 opponents, don't take into account the fact he has gone the distance just once in his last 15 contests. This is a man whose power, or rather the ability to use it, wasn't natural but was something he learned to deliver and has managed to really deliver. This coming Wednesday sees Yamanaka returning to the ring in an attempt to score his 5th straight stoppage and his 6th successive world title defence as he takes on the popular and fun to watch Stephane Jamoye (25-4, 15) of Belgium. Interestingly Jamoye has faced other reigning and former world champions. The two current world champions he has faced are WBO Bantamweight champion Tomoki Kameda and WBC Super Bantamweight champion Leo Santa Cruz, both men that Yamanaka has suggest he'd like to fight. In his bouts against Kameda and Santa Cruz we saw Jamoye come up short. Against Kameda is a narrow and controversial defeat to then Mexican based Japanese fighter, against Santa Cruz however Jamoye was stopped in 6 following a vicious body shot. For Yamanaka a win isn't what he wants, what he wants is a better win than either Santa Cruz or Kamda managed against the Belgian. Those two losses for Jamoye both came more than 3 years ago but will serve as a marker for Yamanaka who is hell bent on prove that he is one of the top pound-for-pound fighters out there right now. Yamanaka is one of the jewels in Japanese boxing. He combines not only thunderous power, from his left hand, but an understanding of the ring, an ability to go to war, lethal finishing instincts, under-rated speed and a genuine calmness to work. If he wants to box he can do it, if he wants to brawl he'll do that, if he wants to patiently wait for his opportunity he can do that. He's amazingly versatile in the ring though knows that he need only connect once with his straight left hand to have an opponent completely void of their senses. The one complaint with Yamanaka is that he can be a bit one handed. His right hand is rarely used as well as it should be and instead of using his hooks and jabs to set up his work he tends to depend on his footwork and cleaver ability to control the distance whilst his left hand is cocked ready to be uncoiled. If you enjoy the mastery behind Guillermo Ringondeaux or Floyd Mayweather Jr then Yamanaka should be your type of guy when he's deciding to box. When he's looking to fight however he's a whole different animal, just ask Ryosuke Iwasa who went toe-to-toe with Yamanaka in a thriller before finally being stopped in a Japanese title fight. We're expecting to see Yamanaka the fighter when he gets in the ring with Jamoye. Not only do we expect to see Yamanaka turn fighter in an attempt to beat Kameda and Santa Cruz but also because of Jamoye's style. The Belgian is an in your face pressure fighter with a love of a good old fashioned tear up. Jamoye can be out boxed, he was recently by Karim Guerfi, but he loves a tear up and if an opponent doesn't decide to pot shot him they are usually in for a hard fight. This was seen in Jamoye's bouts with Lee Haskins and Jamie McDonnell, both of which were thrilling contests from start to end. We expect Yamanaka to be willing to have a tear up here and we expecting him to look for the right hook that he's been spending time practising in the US and of course his destructive straight left hand. With Santa Cruz taking 6 rounds we think Yamanaka will be looking for a finish in round 4. He may not get it but we can't see this one going much further. Our prediction is Yamanaka TKO5 with Jamoye just making it out of the 4th to be met by an almost psychotic Yamanaka in the 5th who will march out with nasty intentions and make sure he punishes the Belgian. After the fight we almost certain that Yamanaka will mention either the US or Leo Santa Cruz. We know that's the fight he wants though we do expect him to have to wait with Santa Cruz likely to face Carl Frampton first some time this year. That would, in theory, open the door for Yamanaka to fight on a US show to raise his profile there before fighting Santa Cruz in early 2015. -This bout is one of 2 world title on the same show, the other will feature Hozumi Hasegawa fighting Kiko Martinez in an IBF Super Bantamweight title fight.